GuruMeher spent 20 years working with clients as a yoga therapist and life coach and 40 years in personal meditation to discover the vital role emotions play in mental health. GuruMeher means compassionate teacher. 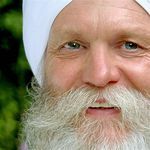 For nearly 40 years he has studied, practiced, and taught innovative and effective techniques to help people find relief from their problems and reach greater mental and emotional health.As a professional Life Coach and Certified Yoga Therapisthe has taught people worldwide how resolve the issues that block their their success and happiness. He is the creator and author of Senses of the Soul, a system of self-therapy using heavy emotions mindfully as a source of intuitive guidance. He works privately with individuals and does workshops in the business and yogic communities. As a public speaker, he introduces larger audiences to the benefits of mind-body-spirit training in a genuine and passionate way. His first book Senses of the Soul – Emotional Therapy for Strength, Healing and Guidance was published in 2014. It is a complete self-study training that has helped thousands of people cope with their emotions. The body of work grew out of classes and workshops designed to help people solve their own problems. GuruMeher continues to travel and teach workshops and leads a 9-month online training based on Senses of the Soul, called Emotional Liberation. Clients and therapists have asked for a “How To” guide to Emotional Liberation which is coming soon. Success! Emotional Liberation sold 671 pre-orders by Oct. 1, 2018, was pitched to 134 publishers, and is in discussions with publishers. Dig in and heal those patterns! And, an invitation to join my virtual community. Share this elevation with a friend. I’ll send you 2 early release copies, signed with a personal inscription. Let me personally introduce you to this work. Share your early release copies with like-minded friends - and those who need some emotional liberating! These come with an invitation to join one of several exclusive live webinars for my pre-order friends in which I walk you through the book and help jumpstart your self-healing work. I’ll send you 5 early release copies. Ready to really do the work and get the rewards? Start a study group to read, discuss and grow together. And kick it off with my online 4-part video class Foundation of Emotional Liberation. It’s full of the concepts and practices that will give you advanced understanding and experience. I’ll send you 10 early release copies. Do you teach or want to lead a healing group? With these 15 copies, you get 2 online classes, the Foundations series above and the Clearing Trauma self-study video series. With this training, you’ll be confident to introduce these skills to others. No pressure; enjoy this advanced training for your own healing! I’ll send you 15 early release copies. This is where I get to help you one-on-one with one of my Yoga Therapy Sessions, 60 minutes of professional life-coaching care. That’s in addition to all the self-care work included from above. I can’t wait to work with you. I’ll send you 20 early release copies. I’ll send you 25 early release copies you can sell at the event. $1000 Serious Student Seeks Satisfaction! I’ll send you 50 early release copies. This book is the result of the work I have done helping people as a Yoga Therapist. If you want big positive changes in your mental/ emotional life, work with me one-on-one for a year. Your work in conjunction with the book will bring significant healing and higher levels of well-being. I want to help people. This offers you a private coaching program as a gift for your support by buying 100 books. I’ll send you 100 early release copies, with your personal copy signed with a message. I’ll send you 150 early release copies. My book Senses of the Soul and companion audiobook. I have a large vision: a world in which everyone when they have emotional pain, knows how to quickly deal with the problem and move on to feeling good. That will be a peaceful world. Emotional Liberation is part of the revolution in mindfulness-based psychological therapy that can bring about this widespread emotional skill and wellness. I’ll send you 200 early release copies you can sell at our live event. Greetings to all of you who pre-ordered Emotional Liberation. You helped me exceed my goals and further validate the importance I feel for the self-healing we all need and can achieve. The next phase for me now is to learn about the 11 publishers who have reached out to me (Yay!) with interest in my book and come to an agreement to work with one of them. And of course, to get to writing regularly! I will update you when there is news to share. PS: If any of you have been sitting on your own book idea, I do recommend Publishizer.